A Little Time and a Keyboard: School's Out Santa Bingo! My daughter is very excited about her holiday break, so I thought that I would make the beginning of her break even a little more special. 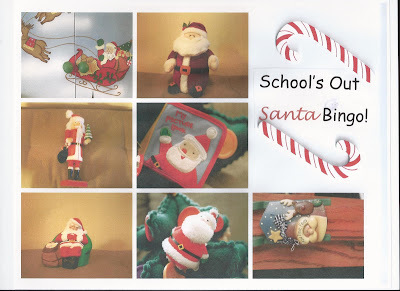 I devised a simple game for her to play upon returning home next Friday called "School's Out Santa Bingo!" I took pictures of various Santa decorations that we have around the house and made the gameboard below. (The gameboard actually looks a lot nicer--my scanner didn't do it justice!) While she is at school on Friday, I am going to hide the Santas around the house (in places where she can see them to prevent her from digging around). When she comes home, I am going to have her try to find the Santas and mark each off with a holiday sticker. I plan on having a small prize like a Santa cookie or something of that nature. I thought that this would be a cute yet simple way to help her kick off her break! This is a great idea! She will have fun.